Here are links to a few books I have managed to write in my spare time. 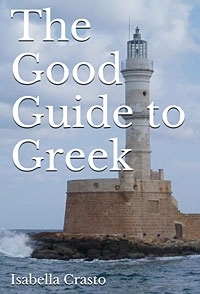 The Good Guide to Greek provides an in-depth look at everyday Greek greetings and will be very useful to tourists and new residents alike. The 1 Juice is a recipe book based on one juice (or smoothie if you like) that we have invented here in Crete. Impress your mate! Amaze your friends! Better yet, learn to use basic greetings and polite expressions to make the most out of your stay in Greece. It's no use muttering "it's all Greek to me" because, of course, it IS all Greek. We wrote this book not so much for travellers and new residents in Greece to learn to speak Greek but rather how to use polite greetings in everyday situations. We won't tell you the correct way to order a souvlaki without onions or an ouzo on ice but we do tell you how to say thank you, it was delicious. We won't explain how to ask for an extra towel for your room but we do tell you how to say please and have a pleasant afternoon. And many many more common greetings and simple yet polite expressions to use ... from Good Morning to Good Night and from Happy New Year to Merry Christmas, and almost everything in between. Plus greetings for children, for ladies who are pregnant or recently given birth, wishes for the sick or unwell, farewell to someone leaving on a trip, and more. Mastering these is easy, and even if you take your Greek studies no further, it is a very impressive start. No prior knowledge of Greek is required. We lead you first through a basic pronunciation guide and then present many greetings and replies that you can use every day. And what better way to show your hosts here in Greece that you appreciate their kindness and hospitality. This guide explains how to prepare what we like to call our "1 Juice." It's more than just a juice or a smoothie; it is a full meal in a glass that provides a huge variety of nutrients as well as lots of fibre. Plus it is easy to prepare on a daily basis, cleanup is a cinch, and it provides a great start to every morning. As an added health and taste benefit, there is no set recipe. This is not a book of "My Favorite 503 Juice Recipes" or "The Best 32 Smoothie Recipes" but rather a concept following a basic recipe with an almost unlimited number of possible variations. 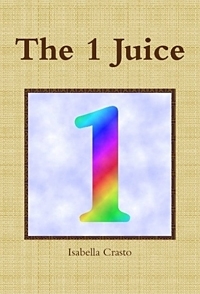 The book explains how we arrived at the "1 Juice" idea then provides the basic method and finally explains how to vary this recipe daily to ensure the maximum nutritional value. As you will see, you can personalise this recipe in hundreds of different ways to create your own "1 Juice" that exactly suits your taste and your physical needs. We have recently added spirulina, wheatgrass, chlorella, and tumeric to the mix for an added kick. It is most certainly a healthful addition ... we can feel the difference!